Further to part 1 and part 2, part 3 looks at the experiences respondents had during their study abroad. I’ll follow this straight away with part 4, which looks at the post-study abroad experience. As ever, your comments and questions are extremely welcome! As noted in the methodology, the majority – 72% – of respondents studied/are studying in countries where English is an official language. Interestingly, no respondents had studied in Australia, although the country is a major importer of international students from other countries in Asia (Marginson, 2006). It seems that students from Tajikistan tend to follow the pattern noted by Roberts of ‘drifting’ from east to west (2010). That said, the two most popular destination universities were in neighbouring countries: to the highly regarded American University of Central Asia (AUCA) in Bishkek, Kyrgyzstan (7 respondents) and the Kazakhstan Institute of Management, Economics and Strategic Research (known by its Russian acronym of KIMEP) in Almaty, Kazakhstan (6 respondents). Following these were the London School of Economics and Political Sciences (UK), Indiana State University (USA), the Institute of Education, University of London (UK) and the University of Oxford (UK). Whilst some geographic reasoning could be drawn from the popularity of AUCA and KIMEP, the survey results suggest that quality and reputation of institution is an important driver. This is substantiated by figure 5, which breaks down the reasons that respondents chose the university they studied/are studying at. Further, a 2011 report from neighbouring Uzbekistan noted that where cost was not an issue for students considering study abroad, the quality of education offered was paramount (uznews.net, 15.11.2011). Although the individual subjects studied by respondents were wide-ranging, the subject groups demonstrated a clear tendency for more practical/vocationally-oriented areas over more traditionally academic subjects, as figure 6 shows. 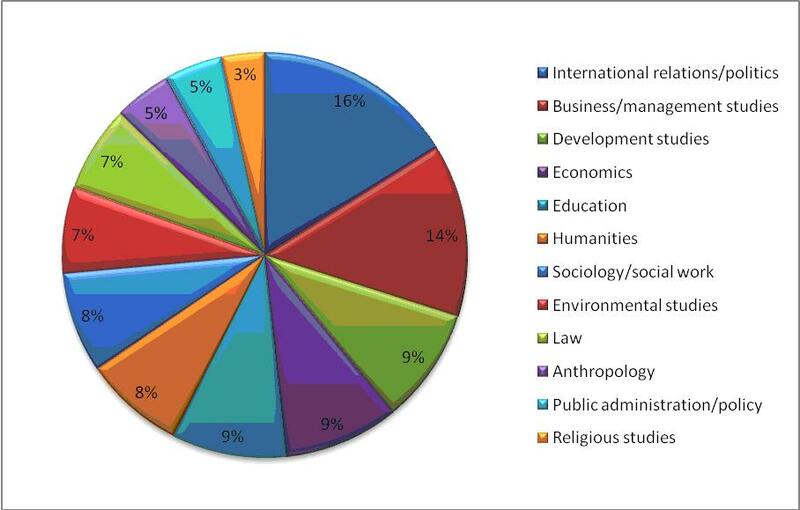 Within the social sciences, areas such as international relations/politics and business/management studies dominated. The popularity of these practical/vocational courses supports the supposition that Tajik nationals see study abroad as a means to improve their career prospects. Respondents were asked to describe how long it took them to adapt once they had arrived at their university. Figure 7 demonstrates that for each instance, the majority of respondents found it relatively straightforward to adapt, taking either less than 1 month or a maximum of 2 months. These responses are extremely interesting given that a study abroad experience is often ‘a significant transitional event that brings with it a considerable amount of accompanying stress, involving both confrontation and adaptation to unfamiliar physical and psychological experiences and changes’ (Cushner and Karim, 2004, quoted in Schweisfurth & Gu, October 2009). However, Furnham (1997) points out that study abroad students are voluntary migrants and therefore have assumed ‘considerable personal responsibility and control’. Furnham also propagates a theory of expectancy-value, which suggests that the more accurate/objective a person’s expectations are, the more successfully they can adapt. These responses again underline the importance of academic improvement as a driver for Tajik nationals studying abroad, and this manifests itself both as a challenge and an opportunity. The perception that higher education abroad is of higher quality and the opportunity to live in a foreign country have been shown to be key drivers for outbound students from a number of countries (e.g. Counsell, March 2011). The main difference that the Tajik nationals showed is a lower concern about developing foreign (English) language skills, which is highlighted in other studies as a major reason to/benefit of study abroad.